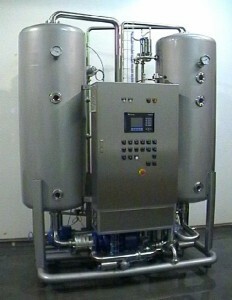 The Moravek model C Carbonator has been designed for the automatic production of both carbonated and mineral water as well as wine and juices (with a maximum fruit content of 12%). The CO2content is adjusted continually within the range of 2.5 to 9g per litre. In addition to the features of the model C the Moravek CE is designed to produce deaerated (still) water and low carbonated water. The CO2 content is continually adjusted in the wider range of 0 to 9g per litre. Still (deaerated) water production does not require an inert gas supply. Both machines are designed to require minimum operator control with fully automatic features and settings as well as being simple to both manage and maintain. They are therefore a perfect choice for businesses who would like to reduce the need to have a constant operator presence during production. The machine is fully automatic and does not require any operator input apart unless there is a fault or a change in production requirements. Easy to operate and change beverage production settings. Fully automatic procedures begin before production starts including the deaerating of vessels. The C and CE models are capable of producing beverages at ambient temperatures if required. The movement of the beverage to the filler is controlled automatically in order to maintain pressure by the booster pump. Includes fully automated CIP procedure which includes gas regulators inside the pipework system and low consumption of cleaning solution. Uses an Allen-Bradley control system and colour TFT display for simple operation. The machines are easy to maintain and contain the minimum number of moving parts, thereby reducing the chances of mechanical failure. 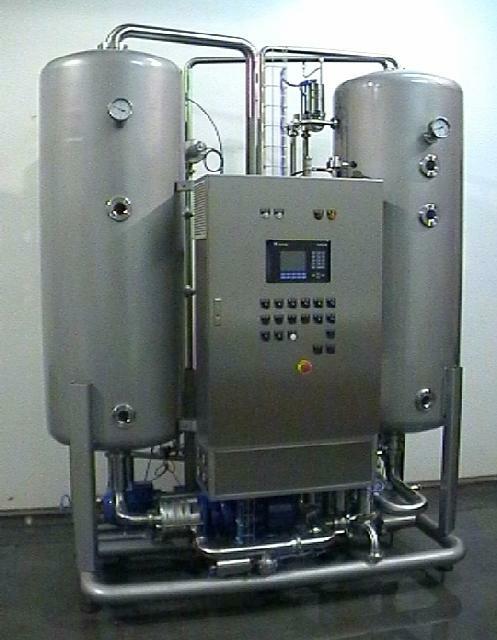 Carbonators are designed for base capacity: 4000 LPH, 8000 LPH, 12000 LPH, 18000 LPH, 24000 LPH, and 36000 LPH.